When Disney announced the release of a new Beauty and the Beast movie, I don’t know who was more excited, my daughter, McKenna Kate or me!!! I have always LOVED the storyline, I couldn’t get enough of analyzing the characters and the meaning behind a beautiful girl falling in love with a beast who really isn’t a beast — ahhhhhh!!! It’s just so fun! I decided to throw a Beauty and the Beast Birthday Party for her that included seeing the movie! There are so many great themes to choose from in Beauty and the Beast but I chose to focus primarily the ROSE. Isn’t that the cutest RSVP wording?! 🙂 I love it! The Beauty and the Beast Red Rose Cake! I have to say, I think this is THE COOLEST Beauty and the Beast Rose Cake EVER!!! And talk about making a statement on the table! IT IS FABULOUSLY HUGE!!! The cake itself is, of course, the rose! We used a triple-layer chocolate cake and trimmed it slightly into a “rose shape” before covering it with buttercream frosting and red fondant! I know, I know… that’s A LOT of red dye – but it HAS to be red – giggle 🙂 If you are not a baker, I’m sure there is a bakery where you live that can make it if you send them a picture!! I have a friend who constructed and painted the base of the cake for me; and he did such a great job making it look like the rose was floating! I have no idea if he would like to make more, but if you have an interest in getting one, message me and I will ask him for you!! It is his business and he loves creating!! He also randomly had a 30″ perfectly-shaped glass dome on-hand! WOW! We all need friends like that! When I ordered the Cake Platter it was out of stock in gold so I had to spray paint it!! If you click on the link it looks like there are a few now in stock! If they happen to be gone when you look, there is a similar one here. Clearly the cake is centerpiece of the decor and I worked everything else around it! McKenna Kate was a little worried, however, that some of the girls might think a “Disney Princess” party was a little “babyish” so I decided to have Emma Watson, whom the girls all idolize, and the Beast, attend in the form of this Beauty and the Beast Life-Sized Cutout!! The kids LOVED this element and it made it feel a little more “grown-up”. For the refreshment table, I found this great Beauty and the Beast Canvas! It is done by Thomas Kinkade and is really a beautifully-done canvas! For the table, I kept it very simple because I really didn’t want anything to distract from the cake! I rented royal blue and yellow tablecloths (I overlapped the yellow for under the cake) and spread red crinkle paper down the center of the table. I placed two simple bouquets of yellow roses (make sure they are not as tall as the cake) on either side of the cake. I rented Gold Chiavari Chairs with gold cushions that accented the gold cake base beautifully! McKenna Kate REALLY wanted to use REAL Tea Cups and Saucers for the “tea” (she was adamant the tea be Sprite!) so I pulled from my mismatched collection and they loved it! I love this Beauty and The Beast Party Flatware I ordered on Etsy! You can specify the colors and they arrived quickly! If you decide you don’t want to use your breakable tea set for the party, these Beauty and the Beast Party Cups are a great option! I am crazy about this Embroidered Rose Denim Jacket !! I tried to order it for McKenna Kate but it was on “preorder” only when I needed it! It looks like it is still preorder but if you have some time before your party you have got to get this!!! If you want an adorable Belle Dress that isn’t so “Disney-looking” this one is so cute!! or the Red Converse Sneakers are adorable! McKenna Kate’s Mary Jane Yellow Wedge Shoe she picked out herself as well! They were great for the party and will be great for summer!! YAY! Beauty and the Beast Food! As far as the food goes, kids are a little picky and so I say keep it pretty basic! I am sharing several ideas I love! From the D23 Official Disney Fan Club there are these absolutely adorable chocolate covered strawberries! The guests at our party LOVED these Strawberry Roses! And, they are EASY to make!! 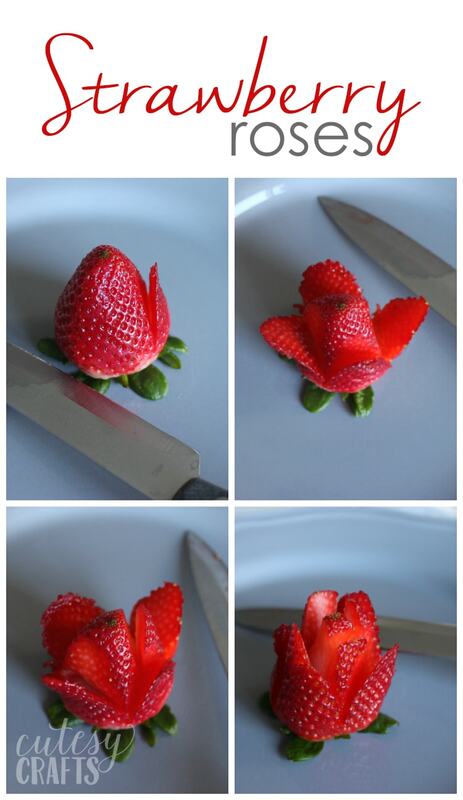 You can serve the strawberry roses on Strawberry Rose Cupcakes of just on a fruit tray. I think these from Cutesy Crafts are so cute using the strawberry flavored cupcakes! I served this Fruit Tea Pot for our party and it was a hit!! I didn’t get a photo of mine before the kiddos pounced on it, so thank you to Party Tales for the photo :)! We also incorporated cantaloupe balls in our pot for the added color and fruit option. How incredible are these Bacon Roses?!!! If you click on the link it will take you to specific directions on how to make them!! I also opted to serve Bagel Bites for the kids! They are a perfect size for a tea party and what they liked the most!!! Off to See Beauty and the Beast – 3D! I went with a theater that had bean bags and couches and the kids had a BLAST!!!! We also did 3-D, but if your child is young you may not want to go the 3-D option! The glasses can be a little bit of a headache for little ones. As we had just eaten (a lot of cake!) I opted for just popcorn and sodas. I had the parents pick up the kids at the theater after the movie ended. For Thank You Cards I opted to do a blank one because McKenna Kate is a little older; but for the little ones, a simple printed one where they can sign their name is great! I do think it is important to teach gratitude, so send some kind of a card to thank your guests for coming and, if you do gifts, for their gift! All in all, WE HAD A GREAT TIME!! If you have any questions about this party, message me! I’d love to see photos of your birthday parties (any theme) as well!!! This Anti-Gravity Ice Cream Sundae is a Showstopper! » « Outdoor Easter Decorations!